Central retinal vein occlusion (CRVO) typically occurs in patients over 45 years secondary to retinal vein thrombosis. Risk factors include diabetes, hypertension, hyperlipidaemia, and glaucoma. CRVO in those aged less than 45 years may suggest a clotting disorder. macular oedema; cotton-wool spots; neovascularization of the iris, angle, retina, or disc. Disc collateral vessels are a sign of resolution. 1. 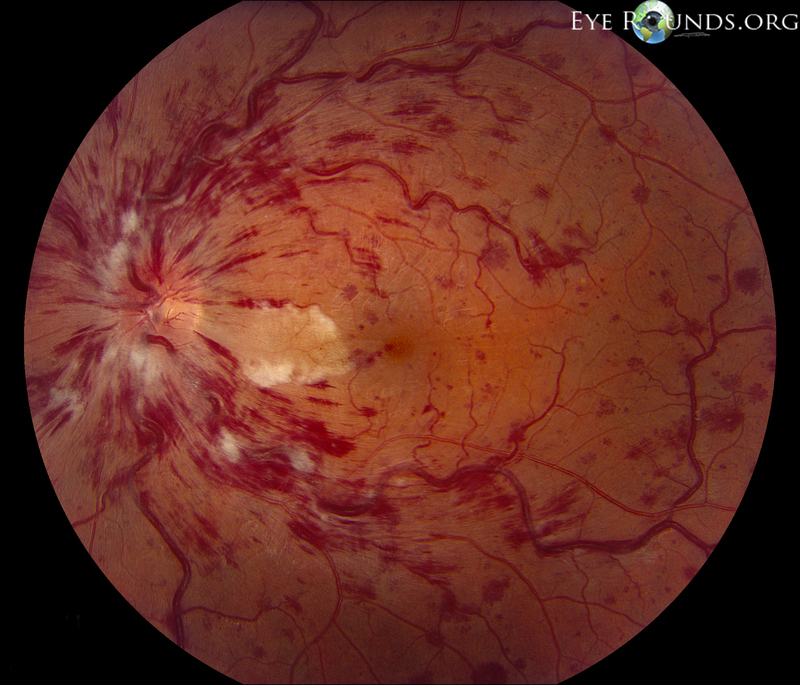 Clinical examination: RAPD, VA <6/60, multiple cottonwool spots, dense midretinal haemorrhages, ‘blood and thunder fundus’. iris, and optic nerve/retina. Examine both eyes for features of glaucoma. Perform digital ophthalmodynanometry to check for raised central retinal vein pressure. In normal eyes, the central retinal vein spontaneously pulses or can be made to ‘wink’ or collapse with minimal ocular pressure through the eyelids. In CRVO, the vein and artery ‘wink’ together or, in extreme cases, the artery is more easily compressed than the vein. The latter may also suggest reduced arterial pressure and ocular ischaemia, so compare with the fellow eye, assuming that is normal. Ocular ischaemia may present with loss of VA due to cilioretinal hypoperfusion. Differential diagnosis Consider ocular ischaemic syndrome; diabetic retinopathy; optic disc swelling for other reasons; and radiation retinopathy. Investigations Check BP, FBC, ESR, lipids (thyroid function if abnormal), plasma protein electrophoresis, and thrombophilia screen if suspicious. Arrange fl uorescein angiogram if ischaemia is suspected (see Classification above). Diabetic work-up varies from random or fasting glucose, to HbA1c, glucose tolerance test, and diabetologist review. Normal fasting glucose is ≤6.0 mmol; impaired fasting glycaemia 6.1–6.9 mmol; ≥7.0 mmol suggests diabetes, but repeat if there are no diabetic symptoms. ■ Surgical: sheathotomy, radial optic neurotomy. ■ Medical: haemodilution; tissue plasminogen activator; intravitreal steroids. Follow–up Every 4 weeks for the first 3 months, then as clinically indicated. The Royal College of Ophthalmologists recommend follow-up for 2 years. to down load UK guidlines on who to treat CRVO, click the following link. Background Branch retinal vein occlusion (BRVO) occurs 2–3 times more commonly than central retinal vein occlusion (CRVO) but has similar risk factors. The main sequelae are macular oedema and vitreous haemorrhage from disc, and retinal new vessels. BRVO affecting the entire superior or inferior retina (hemicentral vein occlusion) has a higher risk of rubeosis and disc new vessels. Symptoms Usually painless loss of vision in one eye but may be asymptomatic. Rubeosis is less common; macular oedema, disc and retinal new vessels, more so. ■ Ischaemic: >5 disc areas of ischaemia on fluorescein angiography. ■ Nonischaemic: <5 disc areas on angiography. History and examination Similar to CRVO. Fully exclude systemic causes in patients with multiple BRVOs. Investigations Same as for CRVO. Treatment Arrange macular laser at 3 months if there is no macular ischaemia and VA remains <6/12 from oedema. Treat neovasculization with scatter retinal laser. Follow–up The Royal College of Ophthalmologists’ recommend 3 monthly review for up to 2 years. Nonischaemic or treated BRVO may require less frequent review.